“Zweiter Theil der Karte von Asien, welcher China, einen Theil der Tartarei, Indien jenseits des Ganges, die Inseln Sumatra, Iava, Borneo, Moluken, Philippinen, und Iapon enthält.” Copper engraving assembled from two sheets engraved by Jacob Adam, published by Franz Anton Schraembl. Dated 1786 in the plate. From his large and spectacular “Allgemeiner deutscher Atlas aller Länder“, Vienna 1786-94. Coloured by a later hand. Size: 94,2 x 68,6 cm. Large detailed map covering all of the Far Eeast from the mouth of the Ganges to West New Guinea and from Tartary and Korea to Timor. Embellished with an attractive title- cartouche. 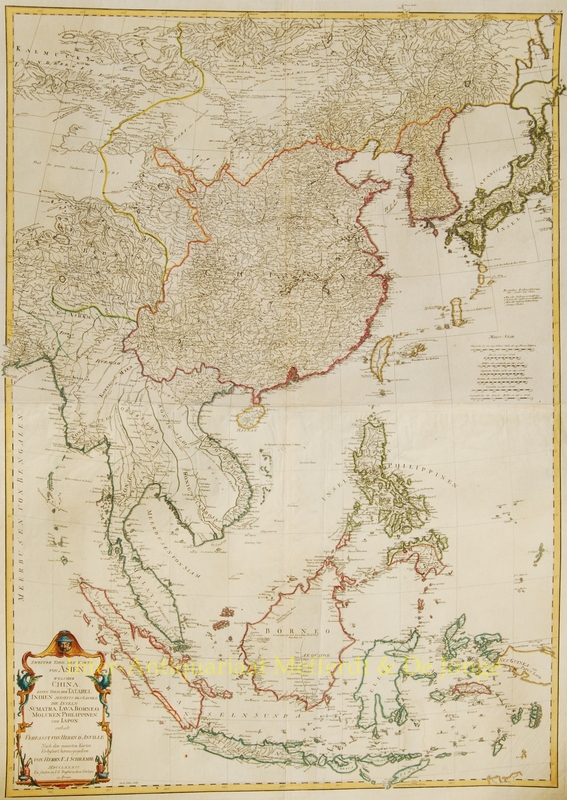 Based on an earlier map of Jean Baptiste Bourguignon d’Anville (1697 – 1782), one of the greatest French cartographers of the second half of the eighteenth century, and author of an important monograph atlas of China.